Dr Dominic Stead is associate professor of urban and regional development in the Faculty of Architecture and the Built Environment. Dominic Stead currently enjoys a full-time permanent position at Delft University of Technology in the Faculty of Architecture and the Built Environment, one of the largest and most well-known faculties of its type in the world. He moved to Delft in 2001 after being awarded a prestigious Marie Curie Fellowship, a European postdoctoral research training grant for young talented scientists. Between 1996 and 2001 he was Research Fellow at University College London in the Bartlett School of Planning and Associate Lecturer at the University of the West of England in the School of Town and Country Planning. He began his academic career as a researcher at the University of the West of England. He has been visiting academic at the University of Queensland (2016) and RMIT (2016), and guest professor at the Friedrich-Alexander Universität (2016) and HafenCity Universität (2010). He is also honorary research fellow at the Bartlett School of Planning, University College London. He has published more than 70 academic journal articles and over 30 book chapters. 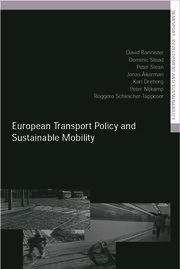 Many of these articles are highly cited, including contributions to Transport Policy, Planning Theory and Practice, and Planning Practice and Research. He has also co-edited five books.